What is Hypnosis and Why HypnoBirthing®? Hypnosis is a naturally induced state of focused concentration – a state of mind and body in which we communicate suggestions to our subconscious mind. This part of our mind influences what we think, how we feel, and the choices we make. It can actually control pain or discomfort. When having your baby with Hypno­Birthing—The Mongan Method™, what you will experience is similar to the daydreaming or focusing that occurs when you are engrossed in a book or staring at a fire. You will be able to talk with the people around you and you will be in good spirits – totally relaxed, but fully in control. You will be aware of your body’s contractions but will be able to determine the extent to which you feel the surge. You can experience your birthing in an atmosphere of calm and relaxation, without fear and tension that cause pain. Your body will replace the stress hormones that create pain with its own natural anesthesia (endorphins). When it’s time for your baby to be born, you will be fully awake and involved. Find out how HypnoBirthing may be exactly what you're looking for so you can have a calm, gentle birth! ​HypnoBirthing™ consists of 5-21/2 hour classes taught over the course of five weeks and is taught both as a group and private class setting. To find out about our upcoming classes and to have your questions answered schedule a 30-minute phone consultation by clicking on the button below, then Discovery Session; you’ll be taken to an online scheduler where you can choose a date and time that works best for you. Call early because classes are limited to 3 moms and their birthing companions. Classes are small so that all participants get individualized attention. 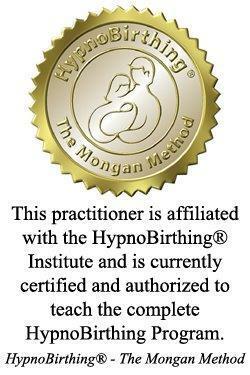 "I wanted to thank you for all of your help with HypnoBirthing™ and the extra support and information you provided. You gave me the strength to let go of my birthing fears and to take each moment as it came. Even when things didn't go as planned, HypnoBirthing™ helped us to remain calm through the process. HypnoBirthing and your teachings also helped us to use our voices to make our intentions well known to the hospital staff. You made us aware of options we wouldn't have known of otherwise. Even though we didn't have the ideal birth we imagined, we were able to feel in control, and make choices that aligned with our plan along the way." "While I was pregnant the second time, Beth helped me get over any fear issues that I had regarding another kidney problem. I contributed the fear removal process with a great pregnancy. I practiced every day and when the time came we went to the Birth Center and the baby was there 40 minutes later. We had a great experience. I wish every soon-to-be-parent could have the opportunity to experience a wonderful birth with HypnoBirthing™. Thanks Beth for your help!" As a Doctor of Chiropractic and yoga teacher that works with many families and pregnant women, I was particularly interested in ways to have the most natural birth possible. I also wanted to be involved and be truly helpful with the birth of my children. HypnoBirthing™ was extremely beneficial. It enabled me to participate as well as allowed not just my wife to remain calm, but provided me with the tools to be calm and fully present. The births were beautiful experiences. My first daughter was born slightly off of our original hopes, but HypnoBirthing™ made flowing with the changes much easier with a happy ending. My second daughter’s birth was short and my wife was amazingly calm and focused. I felt that HypnoBirthing™ gave us the opportunity to witness how wonderful the birth of a child can be. Thank you, Beth, for masterfully teaching us the HypnoBirthing™ method.